Andrew Pykett abused 10 victims from across the UK and one in the US. That's all from us on Friday. Join us again from 08:00 on Monday for more news, sport, travel and weather updates. In the meantime, any breaking news will be posted here. Have a good weekend. Wasps say they're on course to sell-out the Ricoh Arena for their Premiership semi-final against Leicester Tigers. They've sold 26,000 tickets, leaving around 6,000 for the clash next Saturday still available. It comes as the club confirm they've had a record year for attendance - with more than 270,000 people seeing a game at the ground. M6 Warwickshire southbound severe accident, between J3A for M6 Toll and Corley Services. M6 Warwickshire - Two lanes closed and queuing traffic on M6 southbound between J3a M6 Toll and Corley Services, because of an accident. An armed burglar burst into a Bedworth home and threatened the owner with a gun. We're due a dry, but cloudy weekend, with a little bit of sun breaking through and temperatures up to 18C (64F) in places. But it's not looking so good for Monday, with heavy rain forecast for most of us. On our front page this week: Nadhim Zahawi has been awarded £200,000 in damages after winning a libel case over claims he had helped fund so-called Islamic State. A die hard Coventry Bees fan is set to release a fundraising book to raise funds for ongoing support to help get the Bees back on track. The George Eliot hospital in Nuneaton, Warwickshire, is thought to have been hit by a cyber attack. A statement from the George Eliot Hospital NHS Trust said it is currently dealing with a suspected cyber attack, and has shut down a number of systems as a precaution. A number of out-patient appointments have been cancelled and only a limited radiotherapy service is operating. We have implemented our contingency plans and we continue to provide services in A&E and essential services elsewhere. We do ask that patients only use A&E in an emergency and to call NHS 111 for urgent advice and guidance. In order to ensure we maintain quality and patient safety, we have had to cancel a number of out patient appointments, and are operating a limited radiology service. We apologise to those patients affected and we are working hard to resolve the issues as soon as possible. Jaguar Land Rover pay out £19,000 damages after management used "racial slur"
Jaguar Land Rover managers and co-workers regularly used an offensive racial slur to refer to a colleague, an employment tribunal has found. A police officer has praised the bravery of Andrew Pykett's victims for coming forward. Det Sgt Collette O'Keefe, from Warwickshire's child sexual exploitation team, said "as a result of their courage an extremely dangerous man has been convicted". "Pykett is a sexual predator, grooming young girls all over the world, in the full knowledge that they were children, for his own gratification," she said. Pykett from Clarendon Avenue in Leamington Spa abused nine victims from across the UK as well as one in the United States and has been jailed for 15 years. A fresh legal battle over the Ricoh Arena between Coventry City owners Sisu and Coventry City Council is set to get underway in a matter of weeks. The deadline to register to vote in the general election is 22 May. Postal and proxy votes can be requested online until 23 May. Andrew Pykett was guilty of abusing ten victims aged between 13 and 16. Charges against him included 20 counts of sexual activity with a child, seven counts of meeting a child following sexual grooming and also one instance of trafficking within the UK for sexual exploitation. 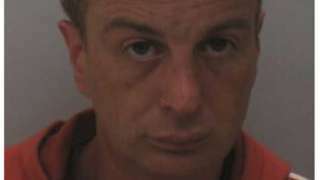 When officers from Warwickshire Police examined Pykett's computers and phones, further victims were identified, with officers finding sexualised conversations, indecent images and graphic sexual abuse of children from all parts of the UK and further afield, including South Yorkshire, Essex, London, Wiltshire, South Wales, Nottingham, Birmingham, Liverpool, Newcastle, Chesterfield and Cleveland, Tennessee in the US, police said. Pykett, from Clarendon Avenue, Leamington Spa, will serve 15 years in prison. Captain Ian Bell made 104 as Warwickshsire racked up 304-5 batting first in their Royal London One-Day Cup game at New Road. You can hear the whole of Worcestershire's reply on BBC Hereford & Worcester's 738AM frequency and online. A passenger who missed her flight as she waited in security queues at Birmingham Airport described the situation earlier this Friday as "complete chaos and unorganised". Sam Butler from Wolverhampton was due to fly at 06:45 BST but said "luckily" the airport put her on a later flight to Glasgow at 08:15 BST. She said it was fortunate she was in no rush to arrive there but criticised the queues. The airport has apologised and said staff sickness and a "mechanical fault" meant two lanes of security had to be closed, leading five people to miss flights. A marathon mum has pulled on her running shoes to raise money for a cause close to her heart. M42 Warwickshire northbound severe disruption, at J8 for M6. M42 Warwickshire - M42 lane closed on entry slip road and slow traffic northbound at J8 M6, because of a broken down lorry.